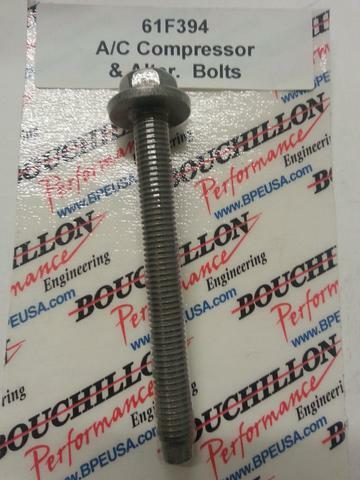 A/C Compressor & Alternator Mounting Bolt Required on 2005-2010 6.1L SRT8 in LX Cars (300,Magnum,Charger & Challenger), 2005-2008 5.7L in LX Cars (300,Magnum,Charger & Challenger), 2005-2010 SRT8 WK (Grand Cherokees), & 2005-2008 5.7L WK (Grand Cherokee) Gen III Hemi ONLY to Mount A/C Compressor and Alternator. Also works on Gen III Compressor & Alternators used in our BPE61FKIT Front Accessory Kits For Muscle Car Installations. It also works on our ARR-513AB ALL Aluminum Gen III 580 HP Crate Engine. These Mounting Bolts Attach Compressor & Alternator Low on Both Sides of Engine. Stock Serpentine Belt works well. 3 required For Alternator / 4 Required for A/C Compressor (Unless Compressor Modified).